SupplierSoft provides a comprehensive Environmental Compliance Management system that enables companies to collect information efficiently from suppliers and analyze the BOM for compliance to evolving regulations and customer specific requirements. The environmental management system enables companies to define and enforce compliance processes and provides a single location where multiple departments in buyer and supplier organizations can collaborate centrally on compliance. EHS contact management: Accurate EHS contact information is the foundation for ensuring compliance. The system ensures that EHS contact stay accurate by periodically asking suppliers to validate these contacts. System also provides a report on invalid or bounced contacts. Material declarations: The solution enables suppliers to provide material declarations information in multiple ways (such as e-mail, on-line), improving the chances of collecting the information. The system supports the full IPC 1752 standard. Configurable validation rules ensure that the declarations meet your requirements for data quality. Lab reports: Suppliers can provide lab reports through e-mail. These lab reports are automatically attached to appropriate materials. Expiration driven reminder: Whether is a supplier running late in providing a material declaration or a lab report that is about to expire, the system can send out multiple configurable reminders to your contacts to ensure that you get the data you need. Regulations and substances: The system tracks all controlled substances and substance categories, along with regulations such as EU RoHS, China RoHS, EU REACH, IEC 62474 and customer specific requirements. BOM analysis: The system performs a BOM analysis to compute compliance information for supplier parts, sub-assemblies and final products. If non-compliances are found, it pin-points the cause of non-compliance and the specific regulations violated. Customer reporting: When customers ask you for material declarations for your products, the system provides a one-click mechanism for generating IPC 1752 declarations, along with any applicable lab reports for materials used. Dashboards and reports: Out-of-box dashboards and reports provide that monitor product level compliance provide real visibility into the product compliance. 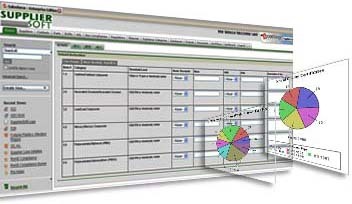 A configurable dashboard and reporting tool enables uses to get to information they need quickly. Environmental specification: Your master environmental specification can be easily shared with suppliers. When specification changes, suppliers can be alerted and send a new copy of the document. Supplier surveys without login: When new substances are banned by regulations or customers, a supplier survey enables you to quickly reach out to suppliers. Suppliers can click on a link in an e-mail and provide information, reducing the need to train suppliers on the system. Integrated project management: When a project requires collecting or updating data from hundreds of suppliers, the solution provides integrated project management tools and dashboards that provide real-time visibility into the project status. Business process management: Compliance business processes that span multiple functional areas and supplier users can be defined and enforced, with central visibility into current status of a process. Central 360 degree visibility: The solution stores all product compliance information and communication centrally and provides 360 degree visibility across business functions. Outlook/Notes integration: E-mails, including mass communications can be sent through the system, keeping an audit trail of all communication with suppliers. Outlook/Notes integration ensures that contacts, calendar, tasks and e-mails stay synchronized. This ensures that all critical communication about a supplier is available in one central place. Notes, documents and search: Notes and documents can be attached to supplier profiles. Documents common across all suppliers such as standardized compliance documents can be easily shared. Entire communication history can be searched through, providing visibility into past interactions.